The first words ever spoken on FM radio in the Pacific Northwest were spoken on KRVM on December 6, 1947. 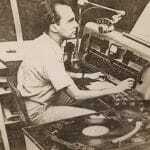 On that date, KRVM was the 13th station in the country, the first in the Pacific Northwest, to go on the air. At approximately 400 watts, the station was considered very strong and provided programming over 30 hours a week. The goal of the educational radio station in 1947, located at the Eugene Vocational School, had two objectives. The first was to be a training facility for anyone interested in qualifying for technical and programming jobs in the rapidly growing radio industry. The second major objective was to be used for the transmission of educational and informational programs for use in the classrooms of Eugene’s elementary and junior high schools. This month, as KRVM celebrates it’s 70th anniversary, much has changed but the objectives are similar: KRVM continues to offer a radio broadcasting program to students and continues to provide educational information but to a much larger audience. With a stronger signal (15,000 watts) KRVM has transmitters/translators in the Eugene/Springfield area, Reedsport, Oakridge and Florence and offers programming 24/7. 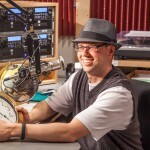 Licensed to the Eugene School District 4J, KRVM is located at Sheldon High School and offers radio broadcasting classes to the high school students and to Spencer Butte Middle School students. KRVM couldn’t have made it to 70 years without the support of the community. Thank you to our members, underwriters, volunteers and staff for keeping KRVM on the air for almost a quarter century. Keeping Real Variety in Music another 70 years! !